Our Host Hotel is the Holiday Inn Express & Suites. Detailed information about this hotel follows. Ask about discount rates for the Show. Just tell them you are with GCRMC when you make your reservations. 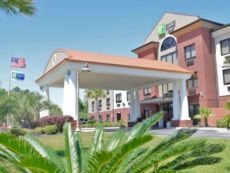 The hotel is just a few minutes from the within a block of each other at the Pine Forest Road exit from I-10. To get to the Show you just to South on Pine Forest Road for a little over 3 miles and the Fair Ground Entrance will be on the right. There will be people directing you where to go to enter your car in the show and for general parking. * Late check out is available. Ask about negotiated Rates for the Gulf Coast Regional Mustang Club.